Whatever our age, our faith will not develop unless we spend time, effort and resources in developing it. I believe that Catholic adults need to wake up to the fact that listening to the weekly homily at mass and going to a Lent course is today totally insufficient to equip them for the apostolate of the laity. Perhaps it was sufficient in ages gone by, but it is certainly insufficient today. We do not live in a Catholic culture; we do not even live in a protestant Christian culture. We live in a largely secular culture. And this means that our Catholic Christian beliefs, values and understanding of right and wrong come into conflict with those of a secular world-view and mentality. And in the conflict we are called to witness to our faith. Of course we are not all called to be public defenders of the faith, but we are all called to "always be prepared to make a defence to any one who calls you to account for the hope that is in you" (1 Peter 3:15). We should ask ourselves, "Am I ready to make that defence?" We are unlikely to be ready if we are not developing our faith and being formed in the faith. There are many people in our society looking for answers, some of them may be our friends, acquaintances, colleagues and family members. We may only be asked once! Will we be ready? It is easy to despair. It is easy to think, "that's not my job, it belongs to clergy, nuns and our catechists", but actually it is the task of all of us to be able to give a reason why we are Christian and how it makes a difference. But let us not despair; let us not pass the buck; let us face the challenge with fortitude and confidence in Christ and the Holy Spirit He sent into His Church! 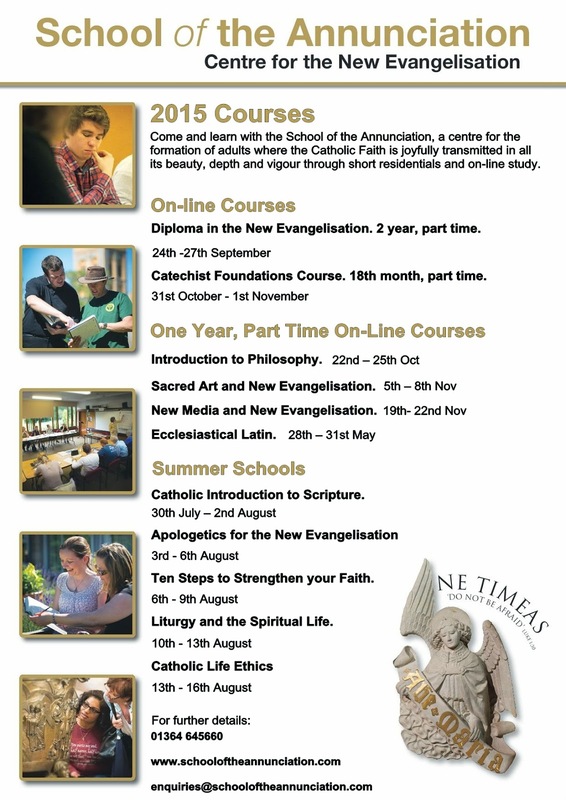 I want to recommend to you wholeheartedly The School of the Annunciation, based here at Buckfast Abbey in Devon. Here you will find a truly faithful Catholic school of the New Evangelisation. Here are staff who have an ardour for the faith, and who also have years of experience providing courses to form adults in the life-giving and joyful faith of Jesus Christ. I can say with personal experience that you will find nothing else like it anywhere else in the UK. One of the great aspects of the school's work is that they specialise in distance-learning. With a combination of short residentials and distance-learning, the growing disciple can benefit from the best of both contexts for learning. At residentials one can build friendships with others growing in their discipleship. With the distance-learning techniques, study is integrated with the rest of our lives. Please look below at the courses on offer. Pray to our Lord asking for guidance. And be bold! Do not hesitate to make a leap of faith.